Well, we had a GREAT Beer Can prep on Wednesday; what a perfect night for sailing! Good compliment of people on board, both experienced, and inexperienced. We are starting to get that together! Jim asked me how we are doing as far as personnel go this year, and I had to be honest; "We are very deep with shallow experience levels." I said that facetiously, but it is true. We are coming along nicely; Princess was up rocking the bow with Young David, Andrew and Ute are cracking the whip on Ryan in the cockpit, Nicole is getting the main up and singing now... John can get the sails up fast, so that will be good.... Things are looking up nicely! There are a few things I would like everyone to think about for Sunday. Maybe read up a bit, sail the boat in your minds, and picture how everything is going to work. Our tacks are nice; crisp and clean. Ute and Sandy are doing a great job getting the jib around and in. I was not able to pay too much attention to the main, other than when we were going downwind. We need to mark out the car locations for the jib; put tape down there, etc. We need to rig the twings every time we go out. 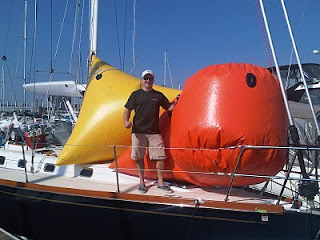 Jim and I chatted Wednesday night about moving the downhaul out to the end of the pole full time, the way we have it when we fly an asymmetric spinnaker. We are getting a little 'bound up' when we have to release the downhaul so we can raise the inboard end of the pole. This bring 2 things into play, and both are bad: 1) The 'chute can bounce around, causing it to lose shape, and therefore efficiency, 2) when the new sheet is"made," and the guy is pulled in, the pole comes aft as far as it can before the guy slides/runs thru the jaw to the donut. By clipping the downhaul at the end of the pole as a proper downhaul, there will be no reason to ease that line any more than we need to for 'squaring the pole,' which is not terribly far back, anyways. In addition, that will free up a set of hands and set of eyes to watch the lines, etc. Jibing is actually a fairly complicated maneuver. We need to execute it not necessarily with speed, but cleanly. Our 'letterbox' takedown seemed to be working ok, but we need to get the lines straightened out as to when everything goes through. Running the guy over the boom worked well, and we are getting the sail in fast, but it is just not quite... snappy. I don't know, I am still mulling it over. I think it'll go quite a bit better. I'd love to go through both our standard 'bear away' leeward hoist, and a jibe set. Jibe sets are great tools to have in the inventory. We have the 'letterbox' that we just started using; it would be really good to be able to make a windward takedown and our good oldfashioned leeward takedown, too. The main difference-- in a leeward, the halyard is blown first. In a windward, the guy comes around first. Sounds complicated, but makes sense for where you want the sail to end up. In addition to all of that (those of you who are still reading,) we will have a real rock star joining us for practice, and then for the COLORs and NOODs, (I hope!) Lynn races on Salsa, the big J boat, and is their Spin trimmer. She is more used to the A-sym than our runner type 'chutes, but she'll be great to have for keeping an eye out on us, and working our sail handling. We'll have a great time with her. Anyways, send your questions to me! We'll be doing some 'dock sailing' before we leave, so that we can go over the line handling that we need to do for practice. We've got some good ground to cover, but everyone has done most of this befire, so it should work out well! Well, we had a great sail today. The wind was a little bit strong for the start of the practice sessions, so given our skill levels at this point, it was more important to simply get the sails up and down properly. We had a great pre-sail chat, and then hit the water (and the water hit us!) Hoisted the main, got the #2 up, reefed the main, and then started practicing in earnest. Lots of tacks; Andrew and Ute working the pit like mad; Nicole doing a great job with the main. Lots of good working out in the off season gives good results when the season comes around again! No flying of the 'chute. We got out on the water, and the 16-20 kt breeze was a little bit much for this early in the season. We did have a short packing lesson before the race, and everyone was able to take their time and start checking out the boat again. Beercan practice is this Wednesday; We'll probably be gone for a short time. Hopefully, the weather will continue to cooperate (that is the forecast,) and we'll be able to get a spinnaker up and down and around a few times. Although the weather may look nice right now, the lake is still quite cold, so be ready for practice on Sunday; dress appropriately. We will all need to be there at 1100, and be ready to be off the dock at noon. We're going to try to get everyone on time from now on. We've got a good crew for practice, and we can get a lot accomplished in very little time, as long as we are ready to go! We'll be rigging the boat for the first time the season, so everything will take a little longer. I've added links on the right, the 3rd section, right below "upcoming events," called "Learning Center." There are a bunch of good lessons from Sailing World's "From the Experts" that we can incorporate, and for some of you who have not had a chance to spend time on the water, this is a good way to get familiar with some of what we will be doing. Hope all is well, and see you on the water!! Well, our intrepid (decrepit?) crew sallied forth, and lo!, a Maskwa was delivered unto Burnham Harbor! The delivery went well; a number of our group got to drive, sails were set, and fun was had. A few of us repaired later on for cocktails at Andrew's new venue, The Shady Lady [That would be a great boat name,] and had cocktails and explored some of our option for the season. Once again, for those of you who have not gone there, please check out www.crewsignup.com, and click on Maskwa. I am keeping that site up to date with info we need for racing, etc, including boat call times, who is bringing lunch, etc. I will also attempt to keep this blog up to date as we get further into the season. I would like to add information on the sidebar with show times, and other general information. Maybe race results? Please give me some feedback and let me know how you think I can make this a better location for information.